It's been more than a month since my last update, and it's been a busy time. Lots has happened, so I thought I'd get you all caught up. 1. THE BOOKS HAVE LANDED! -- Yes, copies of The Littlest Shoggoth have arrived in the U.S. and I'm starting the process of printing out out mailing labels, signing and sketching, and all the other little details that must be taken care of in order to ensure that the books get into the backers' hands. We are well on the way to meeting our goal of hitting our June goal. 2. LAST CHANCE TO UPDATE YOUR SHIPPING ADDRESS -- If you're a backer and you've relocated, gotten a new P.O. Box, or simply haven't yet sent me your shipping details ... NOW is your last chance to do so. Send me a message via Kickstarter ASAP. 3. FIRST CON APPEARANCE -- The Littlest Shoggoth will be making its first convention appearance this weekend (May 3-5) at the H.P. Lovecraft Film Festival and CthulhuCon in Portland, OR. I'm going to be a guest at the show, and the festival merchandise table will be selling copies of the book, the lapel pin, and prints & post cards of an image I drew in honor of the con. If you're a Portland resident (or if you're planning to visit so you can attend the festival) and you'd like to get your backer rewards handed to you personally, shoot me a message so I can bring it with me and we can make arrangements to meet. 4. LAUNCH PARTY IN SEATTLE -- Well, not Seattle proper ... but about 25 miles north in Everett, we're going to have a launch party for The Littlest Shoggoth on Saturday, May 18th at the AFK Tavern (an incredibly AWESOME gamer-themed restaurant that should be part of EVERY gamer's visit to the Pacific Northwest). Details are still being finalized, and will be announced next week, but the date is firm ... so mark the 18th off on your calendar with tentacles ... and join us to celebrate the arrival of the book! I'll be heading to the warehouse tomorrow to pick up cases of the books so I can start the signing, sketching, and such ... if I'm not too overwhelmed by the emotion of the moment, and I don't have a SAN incident, I'll snap a few pics and send a follow-up announcement in the next couple of days. Thank you, everyone, for all your support. We're nearly at the end of this process (though I've still got to work on the caricatures for the Wrangler and Avatar level backers ... and I owe you all at least two wallpaper images). I can honestly say that I'm even MORE excited than I was at the beginning. Unexpectedly, today I received a delivery containing the first two off-the-press advance copies of--yes--the actual finished book! Holy cats! Talk about a GREAT surprise (especially on a Monday!). They look, feel, and even smell AWESOME! (I love "new book smell!) And I can't wait to be able to share them with the rest of the world. We're still on track to send copies out to backers sometime in June. Right now, the rest of the print run is being completed and assembled, and then it will make the long, trans-Pacific boat trip. But for the moment ... I've got two very real copies that I can grin stupidly over. 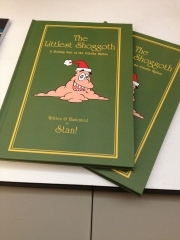 After a few unexpected delays, and one fully expected one (the Lunar New Year celebrations in China), things are really rolling with The Littlest Shoggoth. Over the past weekend, the galley proofs arrived for the book. For those of you who have never been involved with a publishing project before, galley proofs are a single printout of each page done on the actual printing press, so that the publisher can check that everything in the physical product meets expectations. In this case, the galleys consisted of a single sheet with the cover, two other sheets with the front and rear endpapers, and four hand-collated booklets containing the spreads as they will be seen in the book. I'm absolutely thrilled with the way things are looking. The colors are vivid and true to what I'd seen on the computer screen. The paper quality is top notch. And the whole thing looks even better than I'd dared hope. Here . . . have a look at a few of the page spreads. They also sent me a mock-up of the physical book—a book filled with blank pages that has a paper printout of the cover wrapped over it. As you can see, the colors are more faded than in the actual cover galley, but you can still get a pretty good idea of what it will be like to hold the final book. So, you can see that things are actually rolling along pretty smoothly. We only had two minor corrections to request based on the galley proofs, and those are already taken care of. Next, production on the book begins in earnest. Hope you're all as excited about this as I am! Happy Valentine's Day, all! It's been nearly a month since my last update, so this seemed like a good time to let you know what's going on. PRINTING: Printing of the book is proceeding ... well ... it will be, once the Lunar New Year holiday is over. I was hoping to have gotten the galley proofs BEFORE the factory shut down for the holiday but, alas, that did not happen. Now it seems like they will arrive here sometime in the next 10–14 days. I'm sure I'll post pictures when they do. In the meanwhile, this is NOT supposed to impact the final delivery date (since they were planning for the 2-week break SOMEWHERE in the process). PDFs: I must apologize. Backers whose level entitles you to this reward (which is most of you) SHOULD have already had them by now. The files are ready (and have been for weeks), I'm just having a little difficulty figuring out the best way to get them into your hands (or onto your computers, as the case may be). I think the file is too big to just send via email without causing some of you difficulty, and I don't have an easily available download option. At this point, I'm thinking about simply using YouSendIt.com (or a similar site) ... but this is your chance to weigh in on the matter. If you have a better idea, let me know. WALLPAPERS: I haven't started work on those yet, but should during the next couple of weeks. I'll try to post images of the works in progress. CONVENTIONS: Once the book is out, I'm going to start spending more time out and about on the gaming, comic, and anime convention circuit. I'll definitely be at Paizo Con, Gen Con, Jet City Comic Con, and Rose City Comic Con. I'm currently looking into the possibility of getting an Artists Alley table at OryCon, SPX, Baltimore Comic Con, Girl Geek Con, Long Beach Comic & Horror Show, APE, and Aki Con. Most of these shows are in either the Pacific Northwest or the general DC Metro/Baltimore areas. I'm willing to travel to other places, but my budget is limited. However, I'm happy to serve as a Special Guest and participate in seminars, signings, readings, and other special events at conventions that want to underwrite my appearance (that is, help out with travel expenses and/or waive exhibitor fees). So if you have a local or regional show you think would be improved by my (and Squammy's) attendance, let me know ... or let them know how to contact me here or at Stannex.com. That about wraps it up for now. I'll probably post next when the galleys arrive ... so look for that in about a fortnight. Thank you ALL again for your support (both material and moral). It means more to me than I'll ever be able to adequately express. After making a few final adjustments and corrections, the files for The Littlest Shoggoth have been sent to the printer! And so the waiting begins. For those who have never been involved with publishing, here's an idea of what we have ahead of us. The printer will put the job in the queue, and when its turn comes up, their experts will review the files to make sure they are up to spec. If not, it'll get booted back to me to makes changes . . . but let's presume that everything will be fine. In that case, they will print off a complete set of proofs. Proofs are single-sheet print-outs of each page of the book. Once completed, those will be sent to me for approval. Sounds simple, but the printer is in China, so that makes any exchange of physical goods a step or two more complicated . . . not to mention time consuming. If all is good with the proofs, I can give approval via email. If any changes have to be made, I either need to rework the pages, or send the marked-up proofs back overseas, or BOTH. Once the proofs are approved, printing of the book itself begins. 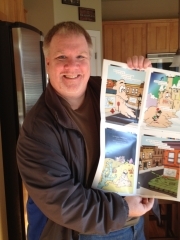 The printer will use some of those first pages to create a hand-assembled version of the completed book, and send that to me for inspection and approval. Again, the difficulties of trans-Pacific business will cause some amount of delay, but by this point the expectation is that all will be fine ... and I'll actually have the very first copy of the finished book in my hands for keeps! 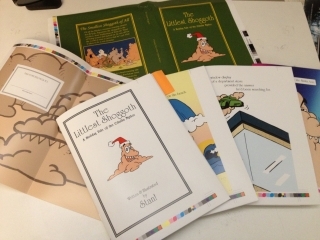 Manufacturing and assembling of the final books then occurs in earnest, and the whole print run begins to be amassed. The first 2 or 3 cases will be sent to me immediately (publishers do this so that they can use them for promotion), but shortly afterwards, the whole print run will be on its long, slow way across the waves via freighter. In addition to the delays caused by trans-oceanic exchanges, since the work is being done in China, an additional delay will be introduced in early February when the Lunar New Year celebration will mean that all production is shut down for a week (or more). Still, little milestones will keep occurring over the next handful of months and, if all goes according to plan, the books will arrive in Seattle by mid-May . . . and we should be able to get them out to all the Kickstarter backers in June, as promised. In the meanwhile, work is underway to send out the post cards and PDFs to the backers who are owed them. If all goes well, both of those things will be accomplished in the next 10 days or so. Things are going well with the preparations to send The Littlest Shoggoth off to the printer. The files are all set. I'm just waiting to get a couple of test pages back to make sure that my color settings will print the way they're intended to. That package should arrive in the next day or two. If all is well with the test pages, we should have the whole job off to the printer before the end of the week. I can't tell you how thrilled I am to be able to say that. In the meanwhile, I'll get to work distributing the digital copies to the Kickstarter backers, and sending out the post cards to those who are meant to receive them. Still LOTS to do ... but we're on the precipice of a major milestone. 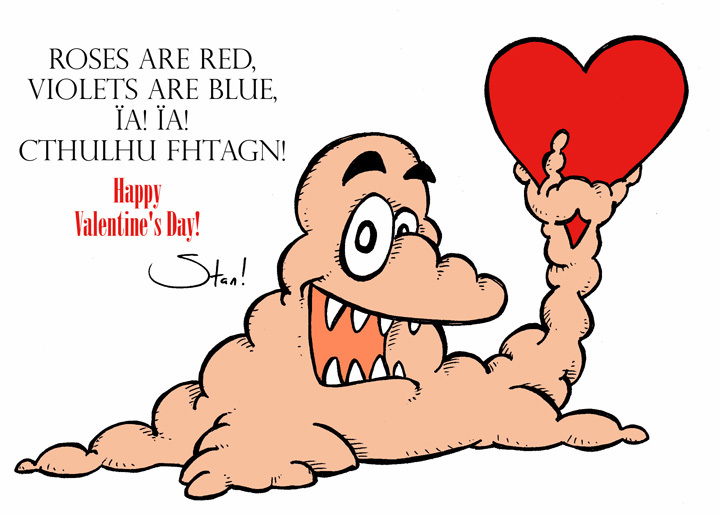 Happy New Year, shoggoth supporters! I haven't made many public proclamations, but I thought it was time to pop in and make at least a brief update. BACKER SURVEYS Surveys have been sent to all backers via Kickstarter. If you haven't received yours yet, log in to your Kickstarter account and check your mail. Once I've gathered a significant number of responses, I can begin the process of distributing the PDF versions of the book, and sending out the post cards. PRE-PRESS Colorizing of the pages is complete, and the new, larger layout is nearly done, too. 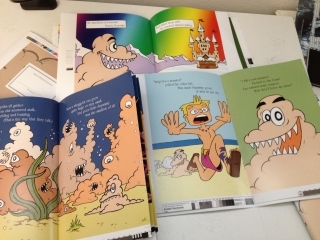 I've been in touch with the printer and am just waiting on some color test sheets (to be sure the final book will look similar to the way it does on the computer screen). Once those come in, I should be able to send the files to the printer pretty much straight away. This keeps everything on schedule for meeting the publication goals set forward in the Kickstarter. WHAT COMES NEXT? After I get the files off to the printer, I can begin work on the new wallpaper art and on updating the Patrons page of this website with the names of all my generous backers. 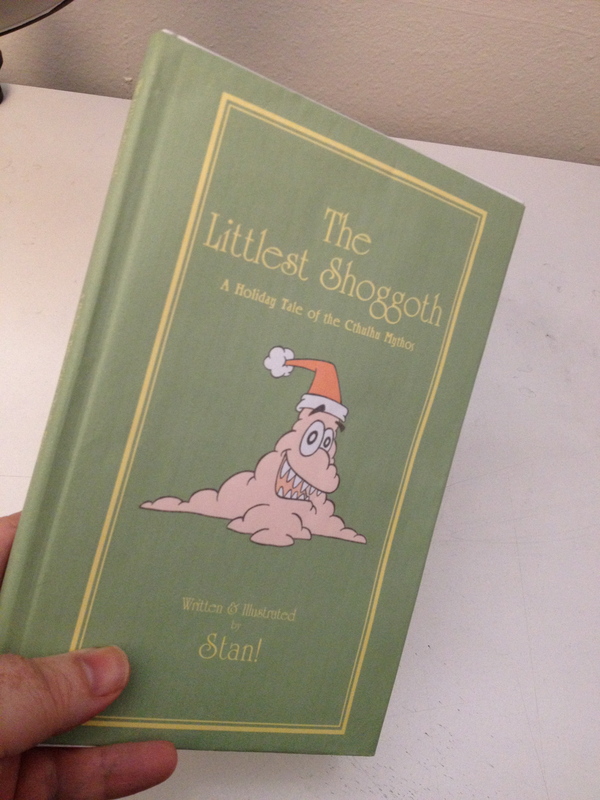 Then, if nothing else requires my attention, I'll start looking at the feasibility of doing some kind of animated version of The Littlest Shoggoth (though, to be honest, that's either going to be a very bare bones affair, or it's going to require a whole new Kickstarter drive of its own). Thanks for checking in. I'll keep the updates coming every week or two. I've decided to redraw one of the pages in The Littlest Shoggoth (one I've never really been happy with ... so why the heck not) ... I guess the "Kickstarter edition" will not only be in color, but it'll have a bit of all-new art, too!